a great result. Can you smell it? Let’s get messy! Just remember I have warned you up front. 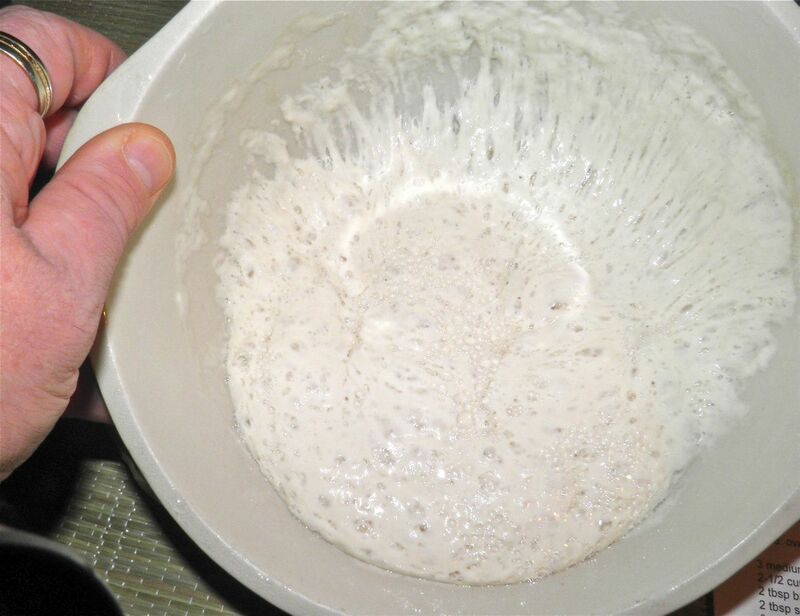 This looks like another of my impossible doughs – perhaps the most impossible-looking one yet, but the result speaks for itself. The potato/flour mixture before kneading and 8 hour rest. You know, I haven’t really found any aesthetic reason why anyone would add potato to bread. I did find a reference to Peru where at one time it was encouraged because of a spike in the cost of wheat. The scarcity/cost of grain may be a reason. I do know that many nations have their own version of potato/wheat bread, including the United States, Canada, Germany, Ireland, Scotland, Poland and several other European states. This is the autolysed potato/flour in the morning. Oh, right. 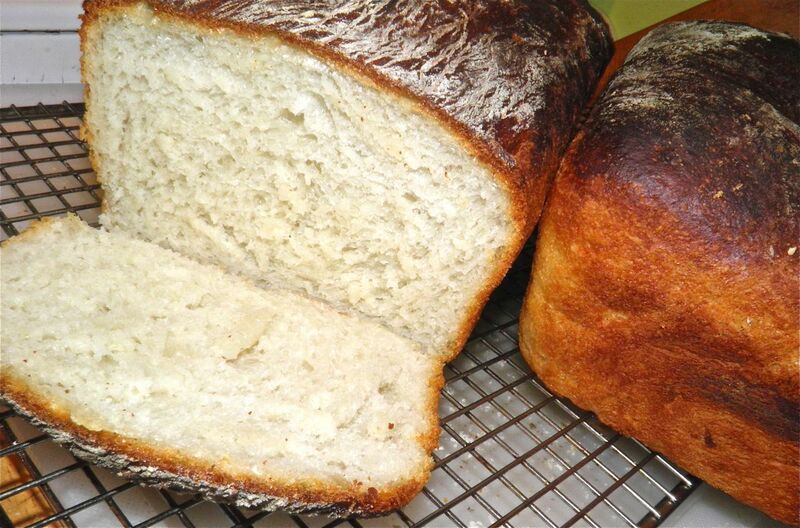 I just realized why you should make potato bread – it’s delicious. Potato bread is made from dough in which potato supplements or replaces the regular wheat flour. 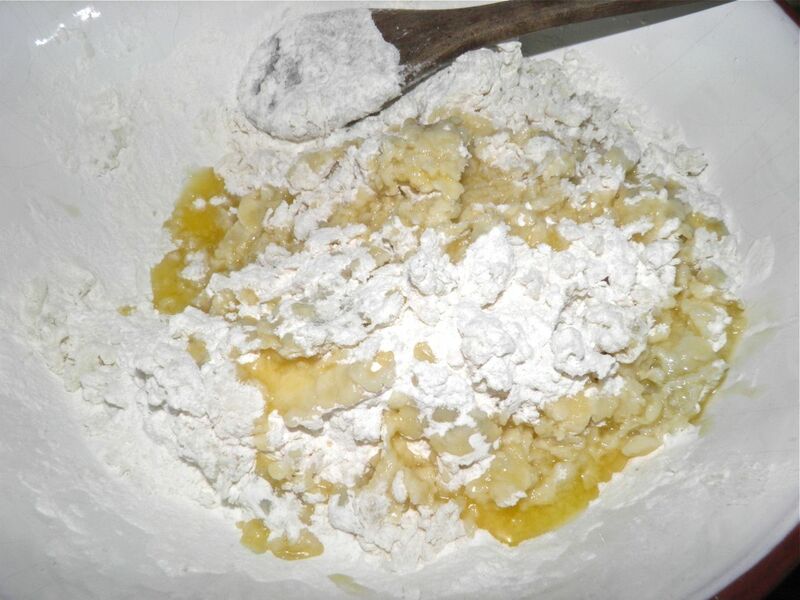 The ratio of potato to flour varies greatly from recipe to recipe. 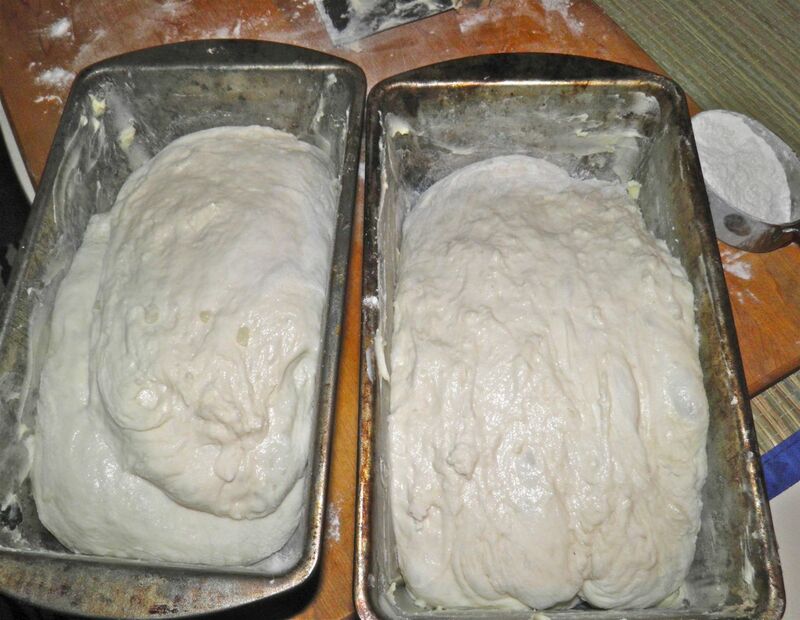 The bread can be cooked in several ways, including baking in a hot pan or conventionally in an oven. It may be leavened or unleavened, and may have a variety of other ingredients baked into it. Some recipes use "riced" potatoes, while others use dehydrated potato flakes. I would imagine those recipes aren’t great-grandma’s. A "ricer" is something that you press potatoes through, kind of like a garlic press. It's not a common kitchen device. Potato flakes are quite new, being invented by a Canadian in 1962. This recipe isn't great-grandma's either. With my newfound confidence in sourdough preferments and autolysed dough I decided to turn a classic recipe on its head. This is the pre-ferment in the morning. It looks like bubbly spider webs. Potato bread is available in some stores in some countries. 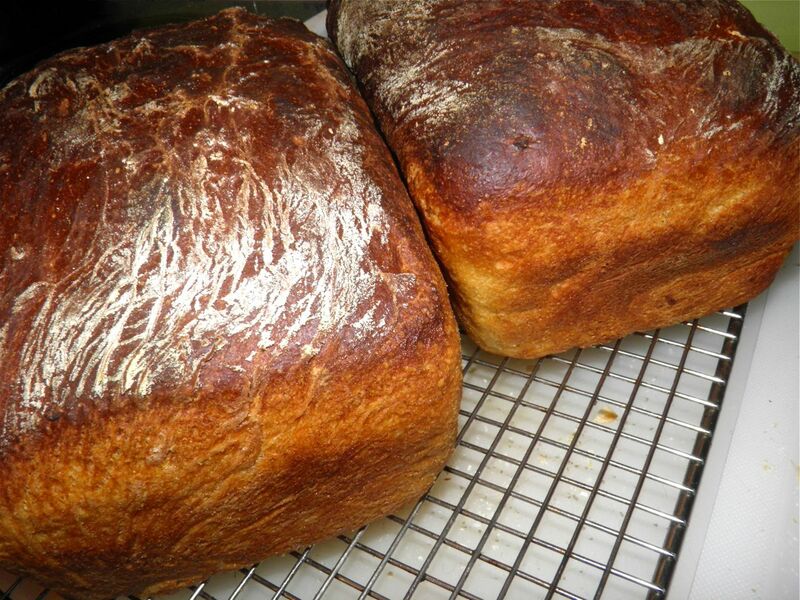 This potato bread tastes nothing like what you buy in the store – if you even can. It also tastes different than regular bread. You get hints of the starch that’s in it from the potatoes. The potatoes make this bread have a wonderful small crumb and the interior is very “luxurious.” It took me a while to come up with an appropriate word. That’s pretty close. My original starting point was an old-fashioned classic recipe. Generations have enjoyed its simple, wholesome flavour. This version continues the tradition. I would make it again in a second. 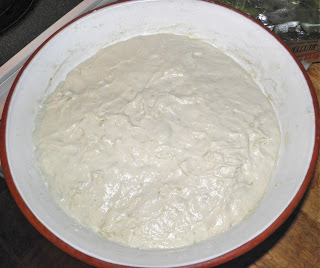 The dough all combined and risen for 2 hours. Very wet. Let the potato water cool down to 110°F before proceeding. Measure the water and reserve 2-1/2 cups. If you have less, top it up with water. Believe it or not, you can get it into two "semi" solid pieces. In a small mixing bowl, mix 1 cup flour, 1/2 tsp yeast and 1 cup of the warm potato water. Cover tightly with plastic wrap and let rise overnight. This is your sour pre-ferment. In a large bowl mix the riced potato, 1-1/2 cups potato water, butter, sugar, salt and 5 cups of flour. 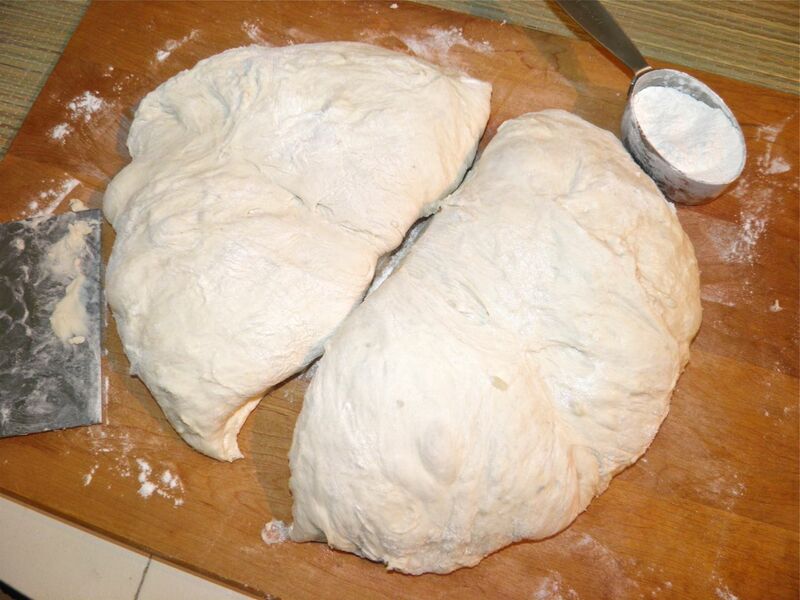 Knead until it all comes together. You will have a mass that just barely sticks to your hands. Cover with plastic wrap and a towel and let sit overnight. In the morning, proof the remaining 2 tsp yeast in the 1/4 cup of water. Combine the pre-ferment, potato mixture and yeast together. Mix with a spoon and then knead until smooth. “Knead” at this point is a relative term. You will be dealing with a very wet dough. 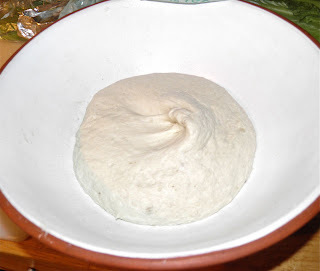 The best way to “knead” it is to run your fingers down the side of the bowl and “lift” the dough up onto itself turning the bowl as you go. Do this for about 5-7 minutes. The dough, flopped into the buttered pans. Resist the urge to add more flour. This is NOT your grandmother’s potato bread dough. Wrap the surface of the bowl with plastic wrap. 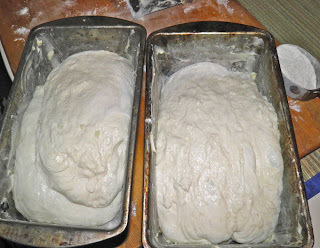 Let the dough rise until doubled, about two hours. Generously butter two 9” x 5” x 3” bread pans and set aside. 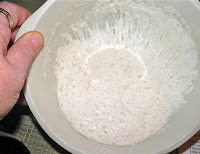 At the end of the first rise, “pour” the dough out onto a generously floured work surface. Using a dough scraper fold the dough up onto itself until it begins to hold a shape for a short time before relaxing. Cut the dough into two equal pieces and pus each half into one of the pans. Let rise, uncovered, for one hour. Preheat the oven to 425°F 1/2 hour before the end of the second rise. Place a pan of water in the oven. Lightly dust the top of the loaves with flour. Bake for about 50 minutes. Remove the water pan after the first 10 minutes and continue to bake until well browned and the bottom sounds hollow when tapped. The end result. Not too shabby.